Contact Us – Get in touch for a free trial today! Cycling not providing the thrill it used to? Bored of lifting things up and putting them down again? Try the workout with a point! You’ll get stronger, faster, more flexible, and learn the techniques of our fast-paced Olympic sport. Fencing is a holistic mind-body challenge; each touch is a different puzzle to solve, as athletes try to hit their opponents without being hit. Technique, agility, strength, speed and creativity all come into play, but each strength reveals its own weaknesses. Our coaches are committed to lifetime sport. Whether you’re young or simply young at heart, we’re infinitely adaptable. 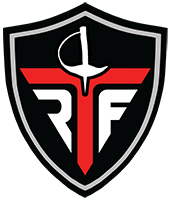 Come see the RTF difference! Class Times: The Adult Recreational class meets on Mondays and Wednesdays from 8-9:30pm. Come try it for free! 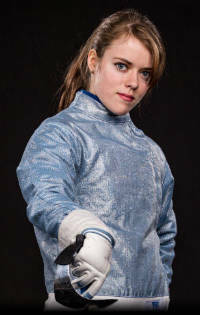 Haley is one of Duke University’s most decorated sabre fencers: 2x NCAA Championship qualifier, 2x ACC Championship semifinalist, and USA National Medalist. Haley hails from Atlanta, GA and enjoys bad memes and extreme coffee.